And in tearful scenes outside the club's Stade de la Beaujoire on Friday morning a 'keep hope' banner was removed in front of the floral tribute. On Wednesday, it emerged an unidentified body - now known to be Sala - was brought off ship, Geo Ocean III, on a stretcher and transferred to a private ambulance before being taken to Dorset Police and the local coroner. 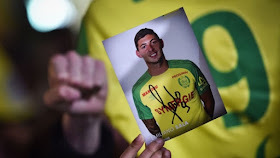 The plane was flying from Nantes, France, the home of Sala's former team, to Cardiff on January 21, when it crashed into the sea with the new £15million signing and pilot David Ibbotson inside.